Police Minister Liza Harvey announced the new penalties in March. Normally an outspoken critic of mandatory sentencing, Tom Percy (centre) thinks the fine is a sensible solution. 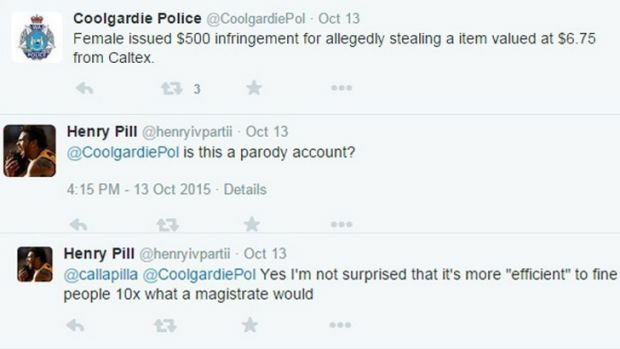 WA's new on the spot infringement penalties are in the spotlight after Coolgardie Police fined a woman $500 for stealing $6.75 of tampons from a Caltex service station and hiding them in a pram. Coolgardie Police on Wednesday tweeted about the incident, which reportedly involved an Aboriginal woman. A police spokesman said the woman was fined $500 because of her lack of court history and to avoid having to process her through the court system. The new laws, announced in March, allow police to fine people who commit low level offences such as stealing and disorderly behaviour in public. Police Minister Liza Harvey said issuing the notices are at the discretion of the police officer investigating the incident. "Stealing of any kind is an offence which the community has no tolerance for and this Government doesn't apologise for handing out swift punishment of actual consequence," she said. Ms Harvey said the legislation will be reviewed and monitored to ensure there have not been any unintended consequences. Her office confirmed that if a person can not pay the fine an enforcemnent officer can seize goods amounting to the outstanding fine. If there is insufficient property to be seized and sold they will be ordered to complete community service. If they fail to do community service or complete, it will result in imprisonment. The new laws were met with immediate concern from the Aboriginal League Service and the ALS of WA's chief executive, Dennis Eggington, suggested the new system would draw Aboriginal people into cycles of unpaid fines. But prominent Perth lawyer Tom Percy QC, who has long been an outspoken critic of mandatory sentencing, spoke up in favour of the new laws in the wake of the tampon situation. He said the paperwork involved in a very simple matter going to court actually cost several thousands of dollars. "On the spot infringements are extremely cost effective and progressive," he said. Mr Percy said little was gained by having a magistrate impose what was usually a nominal and predictable fine in court rather than it being imposed as a set and fixed penalty by the arresting officer. "Its expansion into more serious areas is to be applauded." But social media users weren't so convinced by the outcome of Tuesday's incident. At the time of announcing the changes, Police Minister Liza Harvey said the new system would allow for more efficient and effective law enforcement as police would gain greater flexibility in their response to criminal behaviour. "Currently, police spend a considerable amount of time processing offenders at police stations and preparing for court appearances for petty theft and other minor offences," she said. "That time will now be better spent on the frontline, dealing with more serious criminal matters and responding to community requests for police assistance." This story Coolgardie woman fined $500 over theft of $6.75 of tampons at service station first appeared on WA Today.